BIPTrack was designed to be flexible. It allows the software to bend to fit the process you already use-only more efficiently. Our users tell us that BIPTrack has allowed them to increase caseload while simultaneously improving service because they are spending less time mired in the process of collecting and analyzing data and more time working with their clients. The BIPTrack's adaptable user authentication system enables all client service providers to connect and synergize in a secure, HIPAA-compliant environment. BCBAs, behavior therapists, paraprofessionals, administrators, teachers, parents, educational evaluators, psychiatrists, occupational therapists, speech-language pathologists, and other service providers can collaborate in the client-focused web portal with customizable levels of access. This allows all of the data collection, documentation, reporting, and communication surrounding the client to be managed from one central location. BIPTrack is cloud-based, so it is available 24/7 and there's nothing to install. 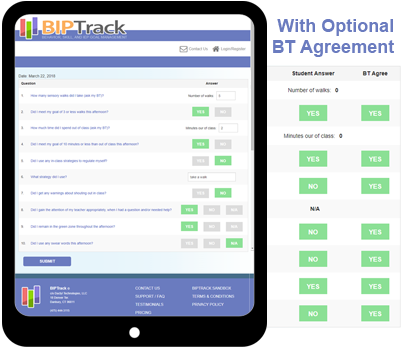 BIPTrack works on any device with a working web browser and fully supports offline data collection. Our advanced data collection system comes packed and without limitations. While other digital systems place caps on the types or amounts of data collected per client, BIPTrack sets you free. 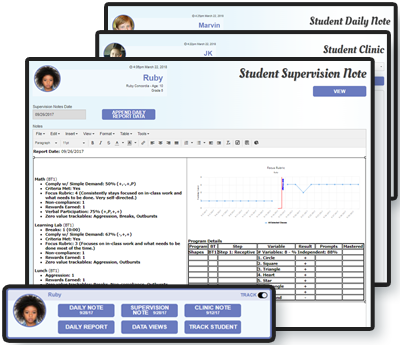 Track an unlimited amount of behavior, academic, IEP goal, reward, skill acquisition, and task analysis data, with corresponding ABC data, across multiple clients simultaneously. Store frequently used comments in the library for later use. Train new observers by collecting and reviewing IOA (inter-observer agreement) "play-by-play" data between multiple observers. Offline data collection is fully-supported! No worries if you lose your internet connection while collecting data because BIPTrack automatically detects the loss of an internet connection. You simply continue collecting data as usual, and then sync the data when your device reconnects to the internet. 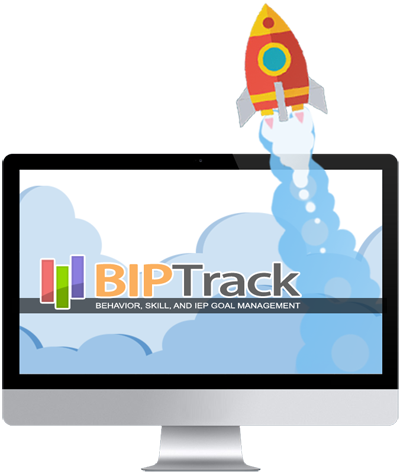 Deploy customizable behavioral (to increase and/or decrease) and academic trackables from the included BIPTrack library, or create your own. Data types include counters, rewards with counters and points, durations (single or multiple), rates (counter and duration), % positive (+/-), % independent (+/-/X), % of occurrence (+/-/prompt), intervals (+/-/X), rubrics, yes/no, and other customizable metrics. 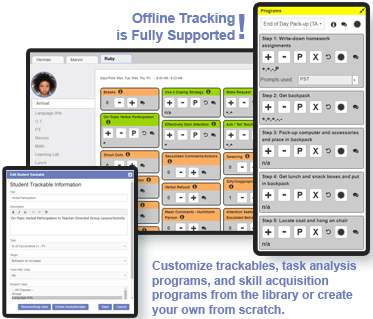 Easily monitor progress, mastery, and maintenance of skill acquisition and task analysis programs. The adjustable definitions for trackables and mastery criteria are always available to the observer via a single click. Empower clients with a sense of autonomy by implementing regular self-assessment through BIPTrack's built-in self evaluations. Optionally collect therapist and caregiver agreement on the same topics to identify discussion points. Self Evaluations can be used to help drive self motivated goal/reward attainment. No limits are placed on the number of questions per self evaluation. No limits are placed on the number of self evaluations you can assign to clients. BIPtrack's reporting system includes real-time daily reports allowing collaborators to instantly see up-to-the-minute progress reports (all observer data is fully annotated). Supervision Notes and Daily Notes can be automatically generated or custom made with the built-in editor. A general Reports builder is also included allowing you to generate any type of custom report, evaluation, or assessment that is needed. Include interactive elements like checkboxes, data graphs, images, and links. Embedded data graphs can be updated with a sinlge click as new data arrives. Your team controls who sees or downloads notes, reports, and other resources. Track when reports, resources, and notes have been viewed and downloaded. Optionally require digital signatures from staff and/or caregivers. Use our included report templates or create your own. Template content can be built with our inline editor or copied & pasted from other document editors like Microsoft Word and Excel, Google Docs and Sheets, or other sources. So if you have templates you are already using, you can continue to use them in BIPTrack. You can even create templates from collections of other templates. 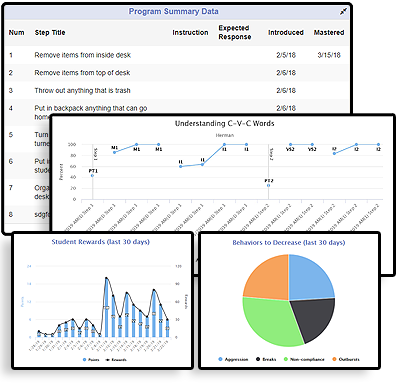 Our advanced Data Views tool allows your team to graph/chart any behavioral, academic, IEP goal, task analysis, and skill acquisition data that has been collected down to any level of granularity required. Graph fully-annotated data by day, week, month, partial day/session, or by observer, with controllable events and phase-changes. Combine multiple class and session data as desired (ex: Graph data from Math and Science classes as one STEM behaviors graph). Display optional trend lines, target data, and scatter data on graphs. Frequently viewed graphs can be "favorited" for quick access. All graphs are downloadable and can also be easily embedded in reports. Define custom graphs types, colors, and labels. Frequently viewed graphs can also be added to client dashboards. Favorited graphs can be open-ended so they automatically stay up-to-date. Favorited graphs can also be edited at a later date. BIPTrack takes security very seriously. Client data, surrounding documentation, communications, and reports are held in HIPAA-approved and encrypted data/file space within the portal, which reduces your overall liability. Collaborators create and view all reports, documentation, and notes within the portal. Notifications (with links) are optionally sent to outside email addresses. Every subscription is separated and is accessible via its own personalized domain (ex: your-organization.biptrack.com). 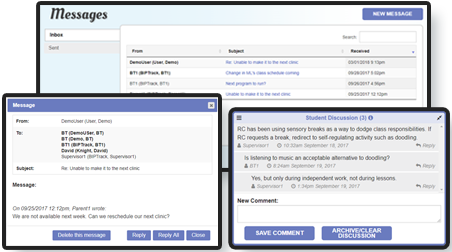 BIPTrack includes several methods of communication, email, BIPTrack internal messaging, per-client discussion threads, and notes (per-client, per-class, and program), which makes it easy to keep team members, teachers, and parents up-to-date. 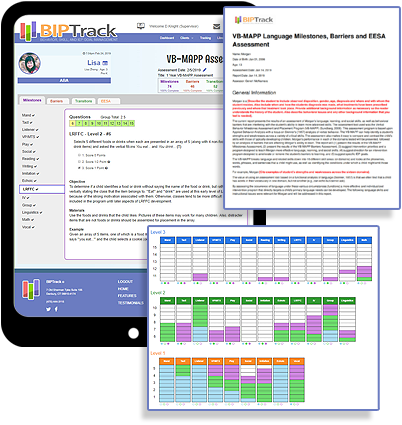 BIPTrack is fully integrated with the Verbal Behavior Milestones Assessment and Placement Program (VB-MAPP), created by Mark Sundberg, Ph.D., BCBA-D.
Each instance of a VB-MAPP includes all reports and placement recommendations. All reports are editable, printable, and downloadable in Adobe .PDF format. Assessment graphs can be seamlessly embedded into reports and supervision notes. VB-MAPP assessments can be initiated from within the BIPTrack portal multiple times for any client. Assessments can be re-run as needed to monitor and track client progress.